Update your deck rail or outdoor wall with flowers using the Panacea Contemporary Window/Deck Planter. 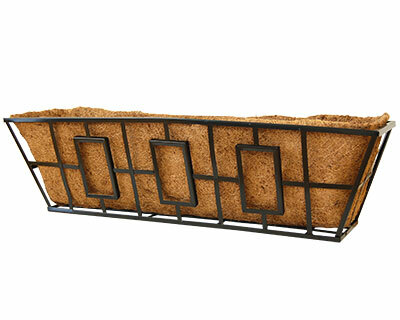 Black, metal bars flare outward from the base to the top of this item, while rectangular detailing along the body enhances the contemporary motif. Round rails on the base add support, and allow this item to be placed on a flat surface easily. The items' 7.5" deep bed creates a wealth of planting area, while the included coco liner both keeps the soil contained and aids in retaining moisture. Use the included brackets to attach this planter to a 2" by 4" to a 2" by 6" deck rail, or place it against a wall with screws (not included). The black, powder coated finish matches virtually any setting, and the all metal construction ensures a durable piece. Bring a modern look to your wall or deck using this Contemporary Window/Deck Planter.